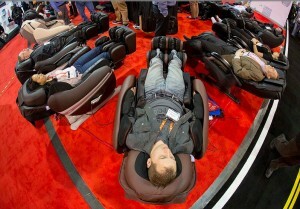 Congratulations to our client Inada USA on robust sales and strong interest in its best-of-class massage chairs among visitors to the 2013 International CES® in Las Vegas! Inada USA is the exclusive U.S. distributor for the Sogno DreamWave™ and Yu•Me massage chairs. Inada’s booth has been one of the more popular destinations at the CES, as this picture from the Jan. 9 San Jose Mercury News demonstrates.